Mata Gujri (1624 -1705) (whose formal name was ‘Mata Gujar Kaur’) was the wife of the ninth Sikh Guru, Guru Tegh Bahadur; the mother of the tenth and last human Sikh Guru, Guru Gobind Singh and the grandmother of the four Sahibzade. She was born in 1624 and was the daughter of Bhai Lal Chand Subulikka and Bishan Kaur, a pious couple of Kartarpur, in present-day Kapurthala district of the Punjab. Her role in the development of the Sikh faith has been crucial. She was the wife of a supreme martyr; mother of a brave saint-soldier; and the grand-mother of four amazing children who all attained martyrdom at the ages of 6, 9, 14 and 18 years. She had been close to the two younger sahibzade and took up their guardianship in the flight from Anandpur under a promise of safe passage to Punjab. Imprisoned in the Thanda Burj of Sirhind with her youngest grandsons Zorawar and Fateh Singh, she attained martyrdom, at the age of 81 years, when she was told of their execution. As a Daughter Mata ji was brought up with the consciousness of the Guru’s light; she fulfilled her parent’s aspiration of serving the path of the Guru beyond their expectations by growing into a perfect role model of grace, strength, persistence and sacrifice. As a Wife She supported Guru Tegh Bahadur Sahib Ji when he was deep in meditation for years, again while he was on his missionary tour, and finally, when the Guru left for Delhi to make the supreme sacrifice. As a Leader After her husband, Guru Tegh Bahadur’s martyrdom, she and her brother, Kirpal Chand had the responsibility of managing the affairs of the Panth. She also organized the langar (community kitchen) and played an important role as the administrator of the army. She had an important role inspiring the Khalsa armies during the battles Guru Gobind Singh had to fight. Her role in the battle of Bhangani is especially remembered. As a Mother She molded the father of the Khalsa, the great Guru Gobind Singh Ji, raising him as a single mother after the martyrdom of Guru Teg Bahadur ji. 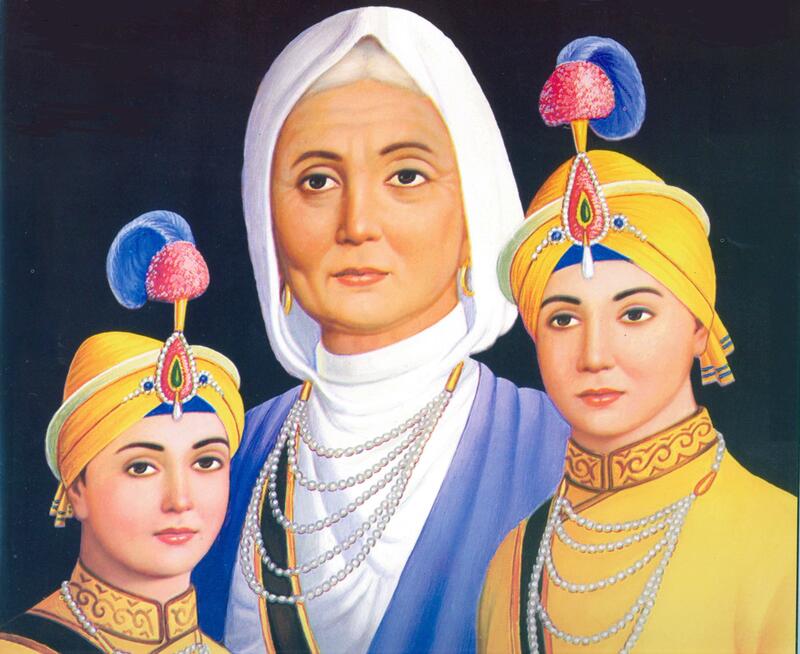 As a Grandmother and inspiration to the young martyrs: When Mata Ji and the sahibzadas were arrested and confined in Sirhind Fort, and as the children were summoned to appear in court each day, she kept urging them to remain steadfast in their faith. She constantly reminded the Sahibzadas that their Grandfather and Great-Grandfather had both sacrificed their lives to strengthen the ideals of Guru Nanak. Her support of her grandsons played such an important role in Sikhism that as Sikhs, we probably owe our existence to her. It was due to her role that the seven and nine year old children did not budge from their beliefs and attained martyrdom. If the Sahibzadas had accepted Islam on that winter day, Sikhi probably wouldn’t exist as it does today. So, in fact, we stand tall because of the teachings and the inspiration Mata Ji provided to her grandsons and thousands of martyrs who gave their heads and not their faith. As a Martyr While imprisoned on top of an open tower during the cold month of December, Mata Gujri continually did simran with no complaints about her physical being. She attained martyrdom the same day as her grandsons after hearing that her grandsons had been bricked alive rather than give up their faith. Her mission had been fulfilled.